Suspended like butterflies caught in mid-flight, the breath-taking creations of the Kate and Laura Mulleavy of the Rodarte label are presented as sculptures in an exhibition that opened on Friday at the Museum of Contemporary Art in Los Angeles. Rodarte: States of Matter includes selections from the designers White Collection (Fall 2010), Black Collection from Spring 2010, Red Collection (2008) as well as the Odile/Black Swan tutus worn in the movie The Black Swan directed by Darren Araanofsky. The Mulleavy sisters are known for their unconventional choice of materials like gauze or cotton cheesecloth as well as their process oriented design involving burning, stretching, weaving, and dying before garment assembly. Their creations under the Rodarte label present a mix of hard/soft and ugly/beautiful elements. This exhibition at the MOCA Pacific Design Centre in West Hollywood was designed by runway producer Alexandre de Betak, who is also a long-time collaborator with the Mulleavys. Each garment sits on a poured resign mannequin form which is largely invisible to the viewer but creates the illusion of a body. 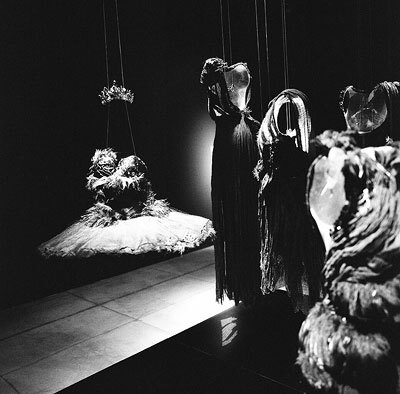 Suspended by wires from the ceiling, the dresses and tutus have a haunting presence. 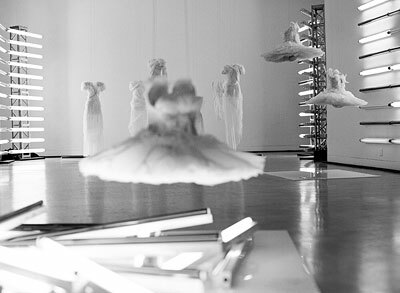 Several of the tutus also spin gently giving the illusion of a ghost ballerina doing pirouettes. On the second level gallery, a light installation adds another level of interest as the gowns are suspended over layers of fluorescent tubes that change in colour and intensity in a looped light show that goes from soft and pretty to hard and flashy. 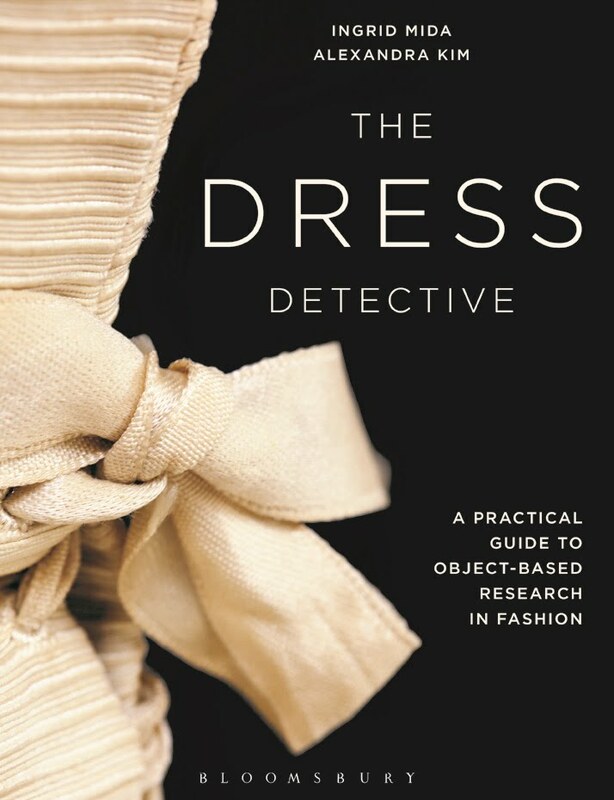 This is particularly effective for the grouping of gowns from the Red Collection that includes the bloodied tutu from the final scene in the Black Swan when the entire display takes on a blood-red countenance. But the light show is distracting for visitors that simply want to appreciate the sculptural qualities of the garments because the sequencing is so rapid and the cycle so short that it feels like there are only seconds to get a proper look under normal lighting conditions. And I sort of wished that there was music (perhaps the music from Swan Lake) to hide the loud fan and the clicking noises of the light show. 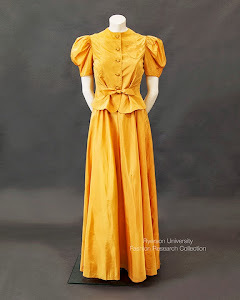 Being able to see these gowns up close made the trek out to this gallery worth the effort. 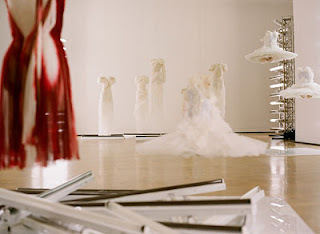 It almost seemed as if the Rodarte gowns were made by fairy sprites as there are no visible seams or points of attachment. Ethereal in their beauty, they are truly works of art. What's on the Fashion Calendar for March?